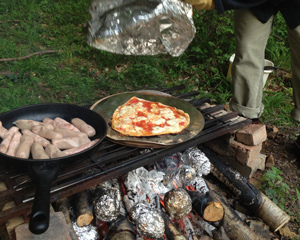 Cooking sausages on a campfire is quite easy but what about when the children want to eat something different in the woodland? 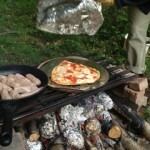 You can do soups, baked potatoes, beans, lots of fried food - but can you cook pizza? 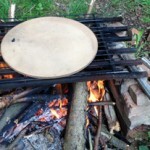 My friend Johnny decided to try it and here's what he did for his "woodland pizza". First of all he had thought ahead and brought the ingredients and the equipment. For ingredients he wasn't content with a frozen pizza but wanted to cook it properly so he brought a dough for the base, tomato sauce, and toppings of anchovies, olives, cheese and capers. As to equipment, he had brought down to the woodland a round pizza stone as a base, a shiny steel circular tray and some silver foil. 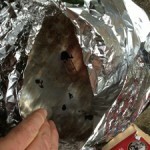 As with all campfire cooking a critical part is getting the fire into a good state so that it is hot, but not too hot, and doesn't have not too many long flames. It's useful to have a supply of different sized pieces of firewood for controlling the campfire without distracting you too much from the actual cooking. Our fire is enclosed on three sides by bricks but these are just loosely stacked, with plenty of ventilation holes between them. 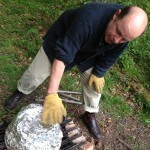 A grill is then rested on top of these so that nothing falls into the fire, but it's important that this grille is as solid and level as possible. 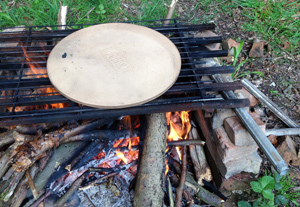 Johnny started by putting his round pizza stone onto the grill so that it could heat up, and then took the steel plate and oiled it with olive oil to stop the pizza from sticking. 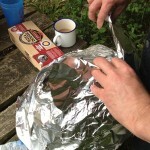 Next he rolled out half the dough onto the steel plate (yes, he was planning two pizzas!) and then spread out the tomato sauce on top. Having transferred all this onto the pizza stone he then added the toppings so that the pizza was now ready for the "oven effect". 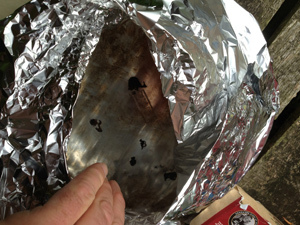 Johnny carefully folded the foil into a sort of metal hat to go over the pizza to trap hot air inside, and he then placed this over the pizza. I asked Johnny when it would be ready. 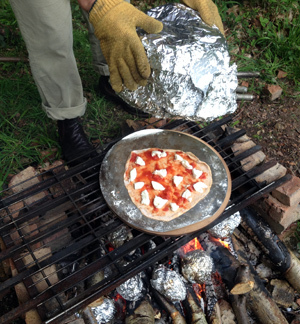 "This is the first time I've made campfire pizza but let's have a look once we can smell a pizza smell", he replied. We soon did. 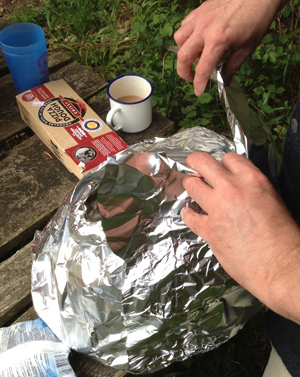 He removed the aluminium foil hat (for re-use), lifted the pizza on its metal base across to the table and found a gaggle of children ready and waiting for a slice of pizza. 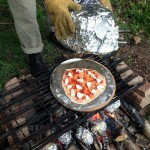 It was a good thing Johnny had planned a second campfire pizza, this worked out even better than the first, perhaps because the pizza stone was now very hot.